IFC is public charity eligible to receive tax-deductible charitable contributions under section 501(c)(3) of the Internal Revenue Code. Our EIN is 59-1224041. We accept credit (Visa, MasterCard, American Express), debit cards and PayPal. We are happy to accept your contribution via credit card. 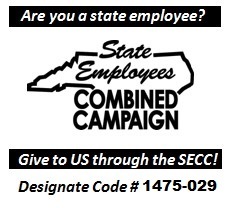 Please call Tara Stephenson at 919-929-6380, ext.26 with your account number and gift amount. Your account information will be kept confidential. Also, please check with your employer about your company's matching gift programs! Your planned gift is an important investment in the life of the IFC. To discuss how you can be a part of strengthening our future, please call Jackie Jenks at 919-929-6380, ext. 14 or jjenks@ifcmailbox.org. Have a vehicle you no longer need? You can help IFC by donating it to us through CARS. CARS accepts all types of vehicles— cars, trucks, SUVs, motorcycles, ATVs and boats. Complete the secure online donation form or call 877-537-5277 to speak to a representative. Just provide the certificate of title upon pick up and CARS will give you a tax receipt for your charitable contribution. Help families in need pay their water bills by donating to the Care to Share (formerly called Taste Of Hope) customer assistance program! Round up your bill to the nearest dollar or select any whole dollar amount to add as a donation to your OWASA bills. You can help provide low-income families with financial assistance for their energy bills. If you are interested in donating any other items, please contact Tara Stephenson at 919-929-6380, ext. 26 or info@ifcmailbox.org.